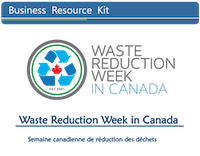 Waste Reduction Week (WRW) in Canada was developed by a coalition of 13 recycling councils and sister organizations from across Canada and is delivered the third week of October each year. The Program’s goal is to inform Canadians about the environmental and social ramifications of wasteful practices. WRW uses its “take action” messaging to empower all Canadians to adopt more environmentally-conscious choices. WRW provides Canadians with information and ideas to reduce waste in all facets of daily living, creating solutions to the many environmental challenges we face. Show your support by submitting a proclamation and let us know why you are proclaiming and what your organization is doing to reduce waste. Organizing waste reduction events is also an excellent way to engage your community in the 3Rs and waste reduction. Any organization, school, community, or business can register an event. Popular events include: waste-free lunches in both schools and offices, hosting waste collection drives (hazardous waste, textiles, or electronics), and free documentary screenings and information sessions. Register your event so that people in your community can find your event and attend it. To help promote awareness and engage Albertans with WRW, we will have iconic landmarks lit up blue and green. To show commitment to WRW we invite Albertans to dress blue and green and take a picture at the following locations and/or other iconic places in Alberta and post it on Facebook and Twitter using the hashtag #WasteReductionWeek. 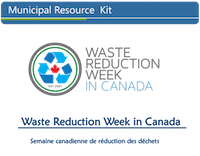 Find more information at Waste Reduction Week in Canada and download resource kits and posters. Each day of Waste Reduction Week will have an associated theme. Participants have the option to support areas that are most important to them or learn about a new issue. Strathcona County in partnership with Waste Connection Canada is hosting their 3rd Annual Waste Reduction Week Shoe Drive Challenge for schools within Strathcona County. During the week of October 15-19 students at participating schools can bring in shoes of any make, size and condition either tied together with the shoe laces or with a rubber band for a chance to win some great prizes. Over the past two years over 28 schools have helped to keep almost 25,000 pairs of shoes out of the landfill and into the hands of those that need them. Rockyview General Hospital in Calgary is working diligently to reduce their carbon footprint and roll out new practices (e.g. switch from plastics to paper, organics program, LED and sensor installations) to reduce waste. In celebration of Waste Reduction Week, Rocky View General Hospital has proclaimed WRW in Canada and pledged to raise awareness in their community. During the week of October 15-19, Rockyview Hospital staff will setup a booth with poster boards and visual demonstrations for staff, patients, and visitors every day from 10:00am to 2:00pm. Goodwill has a long-term commitment to sustainability that goes hand in hand with their social enterprise goal of providing jobs and career training for Albertans with disabilities. The reuse model of thrifting and recycling efforts remove the need to create new items which use valuable resources and damage the environment. Goodwill Industries of Alberta was awarded the Rs of Excellence Award in the Non-Profit category for innovation and excellence in the operation of Canada’s first Impact Centre, a centre dedicated to recycling, sustainability, and environmental stewardship. In the spirit of promoting rewear and reuse of textiles, Goodwill has partnered with the RCA to raise awareness on the environmental consequences of clothing and textiles consumption and provide information on the importance of donating clothes and keeping textiles out of landfills. On October 16th, Goodwill together with the RCA will celebrate Textile Tuesday by handing out Goodwill’s signature cleaning cloths at Rockyview General Hospital in Calgary. Cleaning Cloths: Donated terry towels and cotton t-shirts that do not find a home through Goodwill’s retail stores are transported to the Impact Centre in Edmonton where they are repurposed into cleaning cloths. The Commercial Services team cuts, rolls, and packages cloths that are then sold through Goodwill’s retail operations, and their local partners. Keep up to date with all that is going on during Waste Reduction Week 2018 by following @3RsAB and through the RCA Facebook page. Let us know what you are doing and feel free to use #WasteReductionWeek as we ramp up to the actual week. Triple StaRs Waste Reduction Challenge is a great way for Grade 4 classes in Alberta to find practical ways to reduce waste during Waste Reduction Week and throughout the year. The challenge has been designed to easily fit into regular classroom planning and is a great fit with the Waste in Our World curriculum. For more information, please check out our Triple StaRs page. For more information, please visit Waste Reduction Week in Canada. How Waste Aware is Your School? 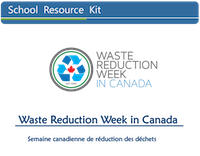 Go to the Waste Reduction Week in Canada website to see tools for classroom activities and more. Visit the Waste Reduction Week in Canada website for more information. Let us know if your school or municipality has made a proclamation.